Deportation is an ancient practice, for example: Khosrau I, Sassanid King of Persia, deported 292,000 citizens, slaves, and conquered people to the new city of Ctesiphon in 542 C.E. The term expulsion is often used as a synonym for deportation, through expulsion is more often used in the context of international law, while deportation is more used in national (municipal) law. Definitions of deportation apply equally to nationals and foreigners. Nonetheless, in the common usage the expulsion of foreign nationals is usually called deportation, whereas the expulsion of nationals is called extradiction, banishment, exile, or penal transportation. For example, in the United States, "Strictly speaking, transportation, extradition, and deportation, although each has the effect of removing a person from the country, are different things, and have different purposes. Transportation is by way of punishment of one convicted of an offense against the laws of the country. Extradition is the surrender to another country of one accused of an offense against its laws, there to be tried, and, if found guilty, punished. Deportation is the removal of an alien out of the country, simply because his presence is deemed inconsistent with the public welfare and without any punishment being imposed or contemplated either under the laws of the country out of which he is sent or of those of the country to which he is taken." All countries reserve the right to deport persons without right of abode, even those who are longtime residents and/or possess permanent residency. In general, foreigners who have committed serious crimes, entered the country illegally, overstayed and/or broken the conditions of their visa, or otherwise lost their legal status to remain in the country may be administratively removed or deported. Already in natural law of the 18th century, philosophers agreed that expulsion of a nation from the territory that it historically inhabits is not allowable. In the late 20th century, the United Nations drafted a code related to crimes against humanity; Article 18 of the Draft Code of Crimes Against the Peace and Security of Mankind declares "large scale" arbitrary or forcible deportation to be a crime against humanity. 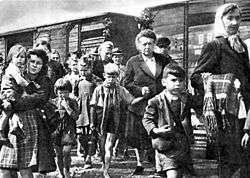 During World War II, Joseph Stalin (see Population transfer in the Soviet Union) ordered the deportation of Volga Germans, Chechens, Crimean Tatars, Ukrainians and others to areas away from the front, including central and western Soviet Union. Some historians have estimated the number of deaths from the deportation to be as high as 1 in 3 among some populations. On February 26, 2004 the European Parliament characterized deportations of the Chechens as an act of genocide. Deporting individuals to a colony is a special case that is neither completely internal nor external. Such deportation has occurred in history. For example, after 1717, Britain deported around 40,000:5 religious objectors and criminals to America before the practice ceased in 1776. The criminals were sold by jailers to shipping contractors, who then sold them to plantation owners. The criminal was forced to work for the plantation owner for the duration of their sentence. :5 The loss of America as a colony, Australia became the destination for criminals deported to British colonies. More than 160,000:1 criminals were transported to Australia between 1787 and 1855. Nazi policies openly deported homosexuals, Jews, Poles, and Romani from their native places of residence to Nazi concentration camps or extermination camps set up at a considerable distance from their original residences. This was the policy known as the "Final Solution". The historical term "deportation", occurring frequently instead of the religious term Holocaust in various locations, thus means in effect "sent to their deaths" — as distinct from deportations in other times and places. Expulsion is an act by a public authority to remove a person or persons against his or her will from the territory of that state. A successful expulsion of a person by a country is called a deportation. According to the European Court of Human Rights, collective expulsion is any measure compelling non-nationals, as a group, to leave a country, except where such a measure is taken on the basis of a reasonable and objective examination of the particular case of each individual non-national of the group. Mass expulsion may also occur when members of an ethnic group are sent out of a state regardless of nationality. Collective expulsion, or expulsion en masse, is prohibited by several instruments of international law. ↑ Jean-Marie Henckaerts in his book Mass Expulsion in Modern International Law and Practice wrote: "As far as deportation is concerned, there is no general feature that clearly sets it apart from expulsion. Both term basically indicate the same phenomenon. [...] The only difference seems to be one of preferential use, expulsion being more an international term while deportation is more used in municipal law. [...] One study [discusses this distinction] but immediately adds that in modern practice both terms have became interchangeable." See Jean-Marie Henckaerts (6 July 1995). Mass Expulsion in Modern International Law and Practice. Martinus Nijhoff Pblishers. pp. 5–6. ISBN 90-411-0072-5. ↑ Henckaerts, Mass Expulsion in Modern International Law and Practice, 1995, pp. 4-5. 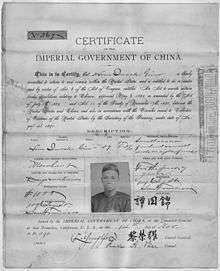 ↑ Fong Yue Ting v. United States, 149 U.S. 697, at 709 (1893). ↑ Smith & Hung 2010, p. 84 fn. 414. ↑ Iorizzo & Rossi 2010, p. 114. ↑ Deportation is the term commonly used to depict ejecting an individual from a political or legal jurisdiction. It has been used by the press, legal community, historians and sociologists. See, variously, "Lewis Attacks Deportation of Leaders by West Virginia Authorities", The New York Times, July 17, 1921; "The Law of Necessity As Applied in the Bisbee Deportation Case", Arizona Law Review, 1961; Martin, The Corpse On Boomerang Road: Telluride's War on Labor, 1899-1908, 2004; Silverberg, "Citizens' Committees: Their Role in Industrial Conflict", Public Opinion Quarterly, March 1941; Suggs, Colorado's War on Militant Unionism: James H. Peabody and the Western Federation of Miners, 1991; Lindquist and Fraser, "A Sociological Interpretation of the Bisbee Deportation", Pacific Historical Review, November 1968. Deportation has also been used to describe these events by Presidential commissions; see President's Mediation Commission, Report on the Bisbee Deportations, 1918. The U.S. Supreme Court has also referred to forced internal removal as deportation; see United States v. Guest, 383 U.S. 745, (1966), Harlan, concurring in part and dissenting in part, at 766. ↑ "The Bisbee Deportation 1917". University of Arizona. 2005. 1 2 3 Hill, David (2010). 1788 the brutal truth of the first fleet. Random House Australia. ISBN 978-1741668001. ↑ IOM 2011, p. 27. ↑ IOM 2011, p. 35. Aguila, Jaime R. "Book Reviews: Decade of Betrayal: Mexican Repatriation in the 1930s. By Francisco E. Balderrama and Raymond Rodríguez". Journal of San Diego History. 52:3-4 (Summer-Fall 2006). Campana, Aurélie. "Case Study: The Massive Deportation of the Chechen People: How and why Chechens were Deported". Online Encyclopedia of Mass Violence. November 2007. Accessed August 11, 2008. Christensen, Peter. The Decline of Iranshahr: Irrigation and Environments in the History of the Middle East, 500 B.C. to A.D. 1500 Copenhagen, Denmark: Museum Tusculanum Press, 1993. ISBN 87-7289-259-5. Gibney,Matthew J. and Hansen, Randall. "Deportation and the Liberal State: The Involuntary Return of Asylum Seekers and Unlawful Migrants in Canada, the UK, and Germany". New Issues in Refugee Research: Working Paper Series No. 77. Geneva, Switzerland: United Nations High Commissioner for Refugees, 2003. Grams, Grant W. "Deportation from Saskatchewan during the Great Depression, the case of H.P. Janzen", in John D. Thiesen (ed. ), Mennonite Life, 2010. Grams, Grant W. "The Deportation of German Nationals from Canada, 1919 to 1939", in Peter S. Li (ed. ), Journal of International Migration and Integration, 2010. Grams, Grant W. “Immigration and Return Migration of German Nationals, Saskatchewan 1919 to 1939”, in Patrick Douand (ed. ), Prairie Forum, 2008. Henckaerts, Jean-Marie (1995). Mass Expulsion in Modern International Law and Practice. The Hague: M. Nijhoff. ISBN 90-411-0072-5. "The Law of Necessity As Applied in the Bisbee Deportation Case". Arizona Law Review. 3:2 (1961). "Lewis Attacks Deportation of Leaders by West Virginia Authorities". The New York Times. July 17, 1921. Lindquist, John H. and Fraser, James. "A Sociological Interpretation of the Bisbee Deportation". Pacific Historical Review. 37:4 (November 1968). McKay, Robert R. "The Federal Deportation Campaign in Texas: Mexican Deportation from the Lower Rio Grande Valley during the Great Depression". Borderlands Journal. (Fall 1981). Nurbiyev, Aslan. "Relocation of Chechen 'Genocide' Memorial Opens Wounds". Agence France Press. June 4, 2008. Perruchoud, Richard; Jillyanne Redpath-Cross, eds. (2011). Glossary on Migration. International Migration Law (Second ed.). Geneva: International Organisation for Migration. ISSN 1813-2278. Silverberg, Louis G. "Citizens' Committees: Their Role in Industrial Conflict". Public Opinion Quarterly. 5:1 (March 1941). Valenciana, Christine. "Unconstitutional Deportation of Mexican Americans During the 1930s: A Family History and Oral History". Multicultural Education. Spring 2006.